Of the more than 60 aboriginal languages across the country that were registered in the 2011 census, only a relative handful — such as Cree, Ojibway, Oji-Cree and Dene — remain strong and viable, the latest numbers from Statistics Canada suggest. In a way, the chattering half-dozen First Nations youngsters are learning their mother tongue for the first time — and the future of the once-mighty Mohawk language is hanging in the balance. The students are a critical component of a language-revitalization program at the Tsi Tyonnheht Onkwawenna Language and Cultural Centre in Tyendinaga First Nation that hopes to breathe new life into the community's original identity, one small voice at a time. "We are quite a success story: we've built enough capacity in our programs that we are able to teach our own now," says Callie Hill, the cultural centre's director. "We were at a point where we had to call in teachers from other Mohawk communities because we didn't have anyone who could speak our language." The program in this community east of Belleville, Ont., is a point of light in a national landscape once vibrant with the sound of more than 70 distinct First Nations languages. Now, of the more than 60 across the country that were registered in the 2011 census, only a relative handful — such as Cree, Ojibway, Oji-Cree and Dene — remain strong and viable, the latest numbers from Statistics Canada suggest. The Cree languages, Ojibway and Inuktitut were the three most common of the 60 aboriginal languages reported in the 2011 census, representing nearly two-thirds of the 213,490 people who claimed one as their mother tongue, the agency reported Wednesday. That's down by about 3,620 people, or 1.7 per cent, since 2006, Statistics Canada said. People with the Cree languages as their mother tongue lived mainly in Saskatchewan, Manitoba, Alberta and Quebec, while those with Ojibway or Oji-Cree mother tongues were mainly in Ontario or Manitoba. Mohawk is among many aboriginal tongues in Canada that are hanging by a thread — in large part victims of the sordid legacy of Canada's residential school system. Many will likely die with the few remaining elders who speak them. Edward Doolittle, head of interdepartmental programs at First Nations University of Canada in Regina, calls it an enormous loss. "We don't even know what we're losing," Doolittle says. "Once we've lost language, we've lost a mainstay of culture. All the knowledge that has gone into our languages and our cultures may be needed again sometime -- and may be needed sometime soon." According to the 2011 census, the Cree languages are showing relative strength, with some 83,475 people claiming them as their mother tongue. Inuktitut was reported by some 34,110 people, while 19,275 people reported Ojibway and 11,860 reported Dene. For many others, fluent speakers are measured in the hundreds, dozens, or even single digits. Mohawk, an Iroquois tongue long associated with one of the most iconic representations of First Nations identity, registered a paltry 545 people, all of them in Ontario and Quebec. The situation is bleakest, however, in British Columbia, which is home to more than half of Canada's native languages. All are in danger of disappearing, with only about one in 20 aboriginals in the province still fluent — almost all of them elders. "Many of the small languages are really extremely endangered," says Olga Lovick, an associate linguistics professor at First Nations University. "Once it stops being spoken a lot in the community, there's so little really one can do." The last 20 years, however, have seen a push to arrest the demise and even turn it around, such as in Tyendinaga. Numerous websites now offer basic lessons along with words and pronunciations. Universities offer degree courses. There are community programs. In some cases, a younger person "apprentices" with a fluent elder in a last-ditch effort to keep the language alive. Sometimes, older people finally give in to a long-held wish. "I always wanted to learn my language," says Margaret Claus, 76, as she struggles with Mohawk at the adult program in Tyendinaga. "It's part of my heritage." Keren Rice, professor of linguistics at the University of Toronto, calls the efforts heartening. "People are understanding that if something isn't done now, it's not going to be possible to do it," Rice says. While about one-quarter of First Nations people report having an aboriginal mother tongue, a higher proportion report being able to speak a native language, as was the case in 2006. The figures suggest second-language programs such as those in Tyendinaga are having an impact. For linguists, the gold standard is whether language is passed on from one generation to the next in the home, something that's not happening in many First Nations families. Experts cite several reasons for why many aboriginals seem reluctant to learn and teach their own tongue. One is the lack of economic payback, although some program graduates go on to earn money as teachers. Another problem, experts say, is the internalization of centuries of racist attitudes — that indigenous language and culture is inferior. "They somehow want to free themselves of their language so they can become more authentically Canadian," says Darin Flynn, assistant professor in the department of linguistics at the University of Calgary. Experts say offering First Nations languages in schools and the small but growing number of university courses provide formal recognition of their value. First Nations University — which has one of the most extensive such programs in Canada — offers major degrees in Cree and Saulteaux, and minors in Dene, Nakota and Dakota. The school is also pushing faculty and administrators to gain facility in Cree. Still, experts worry the various programs won't be enough to win the daunting battle to preserve or enhance fluency, given the pervasive absence of the indigenous languages in First Nation homes, media and governments. 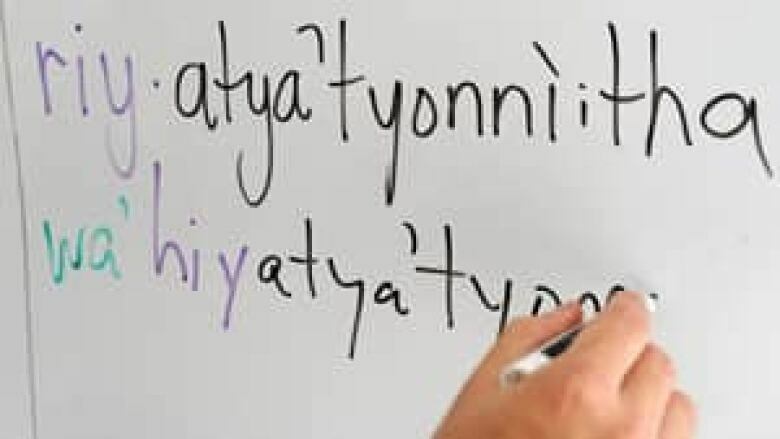 Among Canadian jurisdictions, only the Northwest Territories officially recognizes aboriginal languages — Chipewyan, Cree, Gwich'in, Inuinnaqtun, Inuktitut, Inuvialuktun, North Slavey, South Slavey, Tlicho — in addition to English and French. But even in the Northwest Territories, more people name the Philippines-based language of Tagalog — the fastest growing non-official language in Canada, according to the 2011 data — as their mother tongue than list three or four of the official native languages. Back in Tyendinaga, Hill agrees there are those who see little point in learning their indigenous tongue. At the same time, she says, a few parents are trying to raise their children in Mohawk, and Mohawk is now spoken by about 50 people in the community of 2,200. For the first time in ages, the Mohawks of Tyendinaga can do their own longhouse ceremonies without outside speakers. "Everything that we are is in our language," Hill said. "It is the base of who we are."